Discount available! 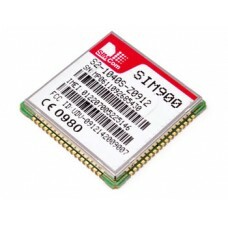 Recommend Module GSM/GPRS with TTS to your friends and get your Discount. The SIM900TTS module is a SIM900 that integrates a speech, implemented by increasing the internal memory from 64 to 128 Mb and with the revision of the integrated microcontroller firmware that governs it. After the firmware update made available to allow the SIM900 to directly read the dual-tone DTMF without using external decoder, the SIMCom has now realized and charged in recent SIM900TTS a firmware release can implement the TTS, ie read the words received through specific AT commands. The voice used for the synthesis can be "adjusted" by setting the volume, tone and speed of speech. The SIM900TTS has the same functionality of the SIM900, which is a GSM / GPRS / EDGE quad-band, able to handle voice calls and SMS, as well as read a keyboard and recognize DTMF bitoni. It integrates a TCP / IP stack and is controlled via AT commands. Its small size (24 x 24 x 3 mm), allow to develop very compact devices such as trackers, GSM telephone combiners, telecontrolli, remote alarms, etc. The module is surface mount (SMT), so requires no connector. The technology that allows our dialer to speak is an authentic speech, which in its general form enables her to speak the words that your device receives in text form: Text To Speech TTS means in fact, literally meaning "from text to speech." So a computer or other device sends the words to pronounce and TTS device turns them into spoken; Sending may be in the form of ASCII characters along a different serial data channel generally or in any other form. In our case, the technology has been implemented in a quad-band phone module SIMCom, signed SIM900TTS, which is basically the SIM900 very well known to us used in various projects telecontrolli and GSM telephone dialers, however, comes with integrated TTS feature. The module allows both to utter the words that are in the form of text contained in a text message or a serial command, is to be sent on line, during a telephone call, the corresponding audio. In the TTS dialer replaces the block that would otherwise be made of a digital recorder. In this new combiner, instead, we have a real voice synthesizer built-in cellular module, which allows us to change the words or phrases assigned to events, and remotely with SMS, either locally by connecting a PC to the communications port. In SIM900TTS the Text To Speech feature can be used in two directions: to listen to the other party, during a telephone conversation, the sound corresponding to a written text, or to convert the text in a text message spoken heard through the speaker be connected to the module output. In our dialer use only the first method, however, one must not forget the importance of the second, which allows us to produce devices such as SMS readers is very useful to know the contents of text messages without reading them and to work on the mobile (handy feature for those who have hands-free operation) is for the blind, so that they can listen to SMS or text that your phone has received or is downloading from the Internet.